An investment that is sure to fire up chefs, cooks, or culinary artists alike is making your outdoor bar and grill yourself. Who doesn’t love outdoor bars and grills? To begin, all you need are the right tools, equipment and some guidance from the pros to get you started. In several days’ tops, you can enjoy your cozy outback bar and grill this summer for endless entertaining. Think of how much you’ll save on being able to be entertained at your home and at your leisure. First, pick your backyard spot. This will be your grilling area plus your bar area in one space. Choose your foundation style by using the different styles of decks at this deck foundation site. Without the appropriate foundation, you will not go far with your kitchen area. These can be made with gravel or sand first. Measure how long and wide you want your oven or grill. The dimensions of a standard brick in the U.S. are different from that of Australia, so know your measurements when pulling out the tape ruler. Also, manufacturers may go by nominal, not actual measurements. “For example, the 4″ x 2 2/3″ x 8″ brick size actually measures 3 5/8″ x 2 ¼” x 8″. The modular size 4″ x 2 2/3″ x 8″ is in actuality 3 5/8″ x 2 ¼” x 7 5/8″ (Source: www.dimensionalinfo.com). Likewise for cinder blocks, measurements will be bigger. To get started, build your grill or oven like the backyard pros. This way you save, and by viewing someone actually doing it themselves, you’ll get step by step motions, and pause when you need to take a break, as they do. First, buying the materials; what you’ll need are sheets of metal, cinder blocks, steel gauge sheets, and gloves. Long time experts that build from scratch explain that the most efficient and easy way to build a BBQ pit is by using cinder blocks. What you want to do is lay out your cinder blocks–4 blocks high–on sand or gravel while squaring up the foundation approximately 4’ x 80” long. The second layer then will be topped by the steel sheet. Then the next two layers will go on next. Put steel 16 gauge sheets (4’ x 80” long) between the layers of the cinder blocks. Then after repeating the layering of cinder blocks twice which will make it four layers all together, you will top it with metal sheets. You will need two sheets slightly bigger than the gauge sheets for gripping when you want to check your food; you simply slide them the sheet back and forth. Watch this pro do it within 30 minutes. And for less than $250, you’ll have your BBQ-pit in a flash. (See this pro in action on how to create this easy to use, mobile grill, and with less money, little help go to Joe Davidson’s website. If the kitchen grill is going to be out on the go on the patio. 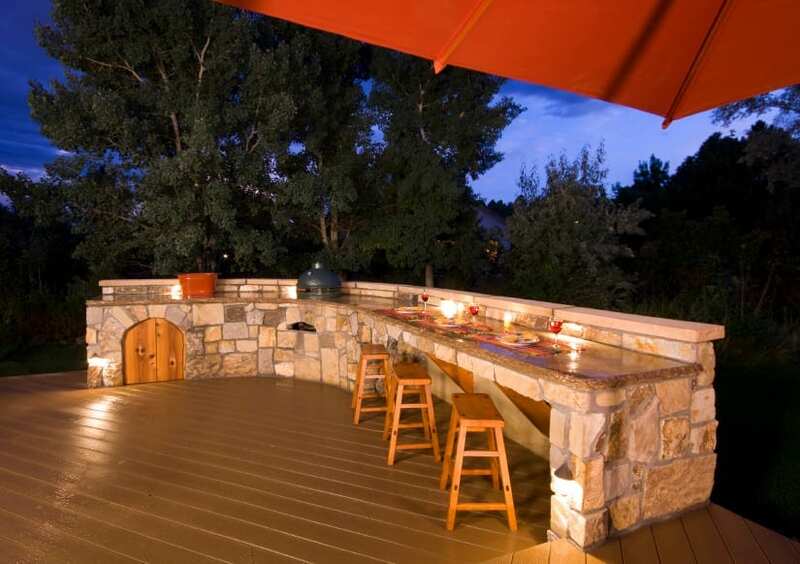 Finding the right grill style for you will depend on what sort of deck foundation you will be laying. Then you’ll be able to put your grill on it knowing that your foundation is fully structured in place and safe for you, your family, and guests. Last thing you need is for your entire party to fall through a deck while eating on the patio! (Source: www.deckcode/2015 and www.deckmagazine.com/decks/2015). In fact, there’s something about being outdoors while being able to “que” on a grill. The only drawback to having a ready-made grill for the outdoor patio, is that there are dozens of types and styles of kitchens that can be purchased ready-made for your family. Some department stores like Home Depot, Sears, even Walmart have affordable outdoor grills. Add a mini-version sign for your patio bar with your family’s last name on it to complete it. One infamous bar that was popular as a TV hit series was Cheers. Replicate the Cheers bar look; purchasing one ready-made will be more practical. Also, the bar sign was bar sign display displayed sticking out of the building; so guess see it before entering down the steps of the building. This style wraps around and you can find them premade or build yourself. Here is a good example of how you can make a bar out of pallets. This would be great for small yards. Yet, one of the favorite outdoor bars for a home-made bar and grill outdoors is the tiki bar look. Go to this the tiki bar how to learn from a pro (Source: Popularmechanics.com/April 2015). Finally, by upgrading your home with a themed bar and grill, you’ll spike up you’re outdoor entertainment. As a result, you want to end up with a bar and grill by the end of the week, tops.